Visualise yourself on the hot seat participating in the show, Who Wants to Be A Millionaire! Enjoy a similar experience on Slingo Who Wants to Be A Millionaire at Wicked Jackpots. It is a game devised by Gaming Realms, combining bingo with slots. As you load the game, you are presented with a 5x5 grid containing various boxes. At the bottom of the grid, find a slot reel which you can spin. During your gameplay on Slingo Who Wants to be a Millionaire, you can see several numbers and symbols related to the iconic gameshow. Your goal is to form Slingos by marking off 5 numbers in a row and reveal a symbol with an attached prize amount. Plus, hit a Full House win in 7 spins or less to trigger an awesome jackpot. Launch Slingo Who Wants to Be A Millionaire at Wicked Jackpots using a PC or any mobile device! Time to launch the game on Slingo Who Wants to Be A Millionaire! Select your desired stake value and click on “Start Game” to commence your gameplay. Initially, 9 spins are provided to you. Your objective is to match 5 numbers on the grid with those landing on the reel in a row to create a Slingo. With every Slingo created, a symbol with a prize attached is revealed. Collect 3 of the same symbols to win corresponding prizes varying from £0.50 to £10,000. Bet Levels: There are no bet levels on Slingo Who Wants to Be A Millionaire. Amount of Paylines Selection: No win lines are offered on this game. Coin Values: Click on the Stake button to select a stake value of your choice. 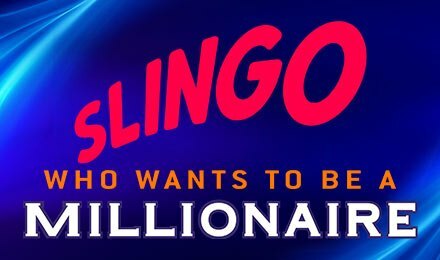 Search for Jokers on the single slot reel on Slingo Who Wants to Be A Millionaire! They speed up your game by marking off numbers on the Slingo grid. If your 9 initial spins are over, Slingo Who Wants to Be A Millionaire provides you with the possibility to buy an unlimited number of extra spins. This means more chances of playing and winning! Land a Full House win in less than 7 spins to trigger the fantastic jackpot on Slingo Who Wants to Be A Millionaire. Grab the chance to win up to 100,000x your stake, which means a whopping £1 million! Play Slingo Who Wants to Be A Millionaire at Wicked Jackpots and spend a wonderful time. All the best of luck!